If you make heavy use of your account, you might run up against plan limits. There are two types of limits set per plan – projects count and storage limit. Out of projects: Out of projects? The account owner can upgrade to next plan anytime. Alternatively, projects can be archived to free up some space. Archived projects don’t count against your plan limit, but the files in them do count against the storage limit. Out of storage space: When you’re out of storage, ProofHub won’t let you upload a new file in your account. Now, either the account owner can upgrade to the next plan to increase the storage allotment, or you can contact ProofHub support to get extra storage space in your current plan, but there will be some additional charges for it. 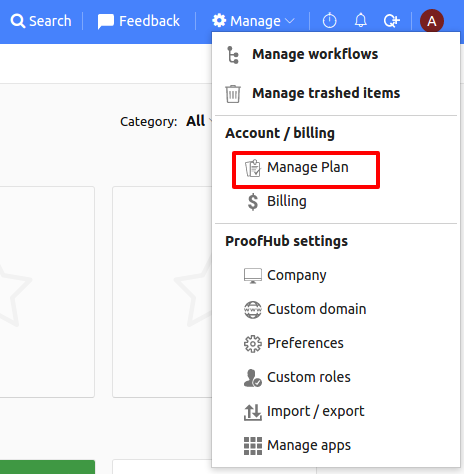 Click Manage and choose Manage Plan option. Choose a plan and then click Upgrade button. You can proceed for payment via credit card, debit card or Paypal account. Fill in the billing information and you are done! Ran out of storage space? Don’t worry. ProofHub offers plans with massive storage space. With ProofHub, you’ll never have to worry about running out of storage space. Ultimate control plan with 500 GB space – $205monthly and $185 annually.